“It used to be we were dealing almost exclusively with hunters,” Biden said on MSNBC. “There’s a whole new sort of group of individuals now who, I don’t know what the numbers are, that never hunt at all but they own guns for one of two reasons: self protection or they just like the feel of that AR-15 at the range.” “They like the way it feels. You know, it’s like driving a Ferrari,” [Biden] said, raising his arms as if shooting a gun. Biden's comments illustrate they now know they have lost the "nobody need an AR-15 to go 'a' huntin'" argument, because Gun Culture 2.0 is not primarily about hunting. Given the near-universal derision of Bloomberg's ham-fisted attack ads with the New-York-actor caricature of all gun owners as hunters, it figures that our enemies would soon get some better intel. And they have. The Left has switched tactics to "you need to give up your little hobby horse. Who needs a Ferrari, anyway?" This is good, and bad, for us, defenders of the fundamental right to keep and bear arms. One good thing is that the opposition now admits that the 2nd Amendment is as DC v. Heller describes, that is, not just for "sporting purposes." That's an admission we've been waiting for from the left. only has a clip with ten rounds in it instead of 30 rounds in it?” [Biden] asked. 'Inconvenience' describes something you give up that you can live without, and that's the Biden's point: it's just another hobby, like stamp collecting. Every time the gun banners try to ban guns or magazines-- bans which do nothing to address violence (quite the opposite)-- they act like we should just roll over, because the 'inconvenience' is minor. After all, Biden says, it's just a hobby, like driving a Ferrari. "Who the hell needs a Ferrari? ", Biden is saying. Oh, and for bonus Marx points, Biden employs class envy. The green envy monster. Biden is employing envy to turn the lower classes against those "Ferrari" owners. Look, Biden's premise is completely wrong. 'Inconvenience' is not something that should be discussed in the context of fundamental rights. We the People have a fundamental right to keep and bear arms-- determined by US v. Miller (1939) to be "militia weapons" and DC v. Heller (2008) to be those "in common use" -- and those rights "shall not be infringed" by the government. What compelling state interest is there in disarming people? How does that forward the stated purpose of the United States federal government, as stated in the preamble to the Constitution? How does disarming us provide for the common defense? Promote the general welfare? Secure the blessings of liberty? And that's just the first of the three criteria. No fundamental right can be infringed based on what the elites think the common person "needs". That is Marxism, not the American founding. The fundamental assumption of our Republic is to be liberty, not asking permission. When "do you need that?" is the question, then answer from a Marxist state is always going to be "no, we will determine what you need." That is not how fundamental rights work. That is not how freedom works in America. Our question in return should be, "what is accomplished by infringing our fundamental rights?" In other words, what is the compelling state interest? But, the hysterical rantings of a superannuated, fish-out-of-water-in-the-burbs, backwoods hillbilly from West Virginia do not matter. 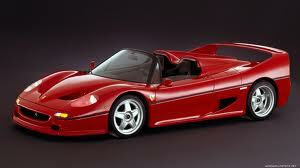 The Senate will vote to ban these Ferraris. Who needs one, anyway?